Well, well it’s safe to say December 2017 has been #Virushka’s month! After quietly flying out of Mumbai for their private wedding ceremony in Tuscany that took both the Bollywood and cricket fans by storm, the couple went for a mini-moon in Europe! 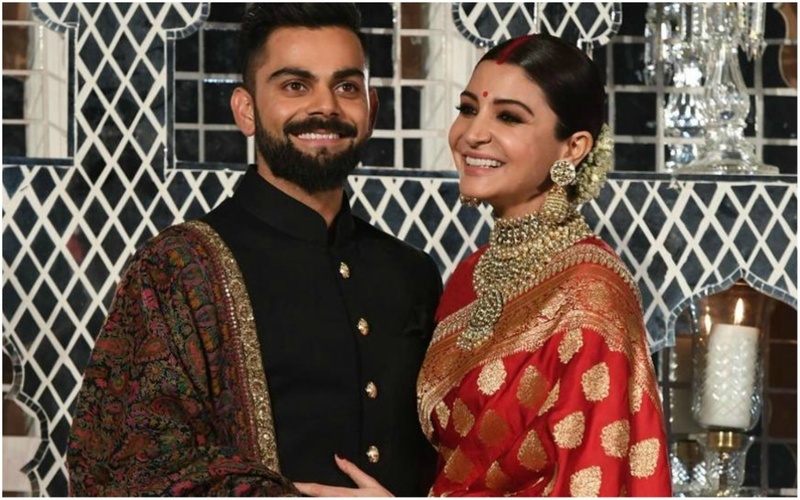 Virat Kohli and Anushka Sharma finally returned to the capital and hosted a lavish reception at Durbar Hall of Taj Diplomatic Enclave lat night and it was an affair to remember. Continuing with their designer of choice, the couple made another stunning appearance looking totally regal this time, in Sabyasachi . The ace courtier had put together the looks for their previous ceremonies too! Anushka Sharma took the traditional route in a bright red and gold brocade banarasi sari. It’s quite a change from the lehengas brides usually opt for, from the same label. The star completed her look with a choker also by Sabyasachi bridal jewellery label and sindoor, mogra & the signature small red bindi. Her beauty look consisted of very natural makeup, dark kholed eyes and a dash of pink on the lips. While Virat on the other hand, wore a black silk bandhgala with a white silk kurta and a hand woven brocade churidar. He completed the look with mojiris and a pashmina shawl featuring red accents, complementing Anushka’s bright look in a very elegant and subtle way. The event saw many political heavyweights join in the celebrations but possibly none bigger than Prime Minister Narendra Modi himself. The newlyweds had met and extended the reception invite to Prime Minister Narendra Modi which was heartly accepted. The other attendees at the reception included Suresh Raina And Shikhar Dhawan. All is not over in the #Virushka’s festivity land yet, as the couple gears up to host another wedding reception at the St. Regis in Mumbai, on 26th December 26, to be attended by Bollywood’s A-listers. The couple is even back in Mumbai for the same and was spotted at the airport today looking their gorgeous stunning selves. They sure are setting #CoupleGoals all the way!